Ramping up for the National Homebrewers Association conference, my club is going to be serving our beers at club night! I’ve (perhaps foolishly) agreed to provide three kegs, using some of my more tried-and-true recipes. First out: Gondwana Pale Ale. I’ve made this recipe in two previous iterations, and have modified the grain and hops bill just a touch as my techniques are refined. Additionally, I’ll be using a liquid yeast starter (WLP001) instead of dried yeast (Safeale US-05). I mashed in with 3.185 gallons of water at 164°, nailing 152° on the nose for a mash temperature. This had declined to 151° after 10 minutes and 150.4° after 35 minutes. I added 1.18 gallons of water at 190°, which brought the temperature up to 154°. I let it sit for 10 minutes, vorlaufed, and collcted 3.25 gallons of wort. I added 3.18 gallons of water at 185°, which brought the mash temperature up to 172°. This was a touch high, so I added .125 cups of ice cubes, which brought the temperature down to 165°. I let it sit for another 10 minutes, vorlaufed, and collected the rest of the wort. All told, I collected 6.95 gallons of wort with a gravity of 1.037. This works out to ~72% efficiency. Because my efficiencies have been a touch low the last two batches (compared to the usual 75%+), I rechecked the gap on the rollers on my grain mill. Sure enough, they had slipped out just a touch, so I readjusted them back to 0.039. I brought the wort to a boil and added the first hops charge after 25 minutes (for a 35 minute total boil). I added the Irish moss after 50 minutes of boiling. I added the second hops charge 1 minute before flame-out. At flame out, I removed the “old” hops, left the “new” ones in to steep, and cooled the wort. Once it was down to ~75°, I transferred the wort to the fermenter and pitched the yeast. I have ~5.5 gallons of beer in the carboy, with a gravity of 1.048 (exactly where I was at for my last batch, too!). I’ll be fermenting it at 66°. 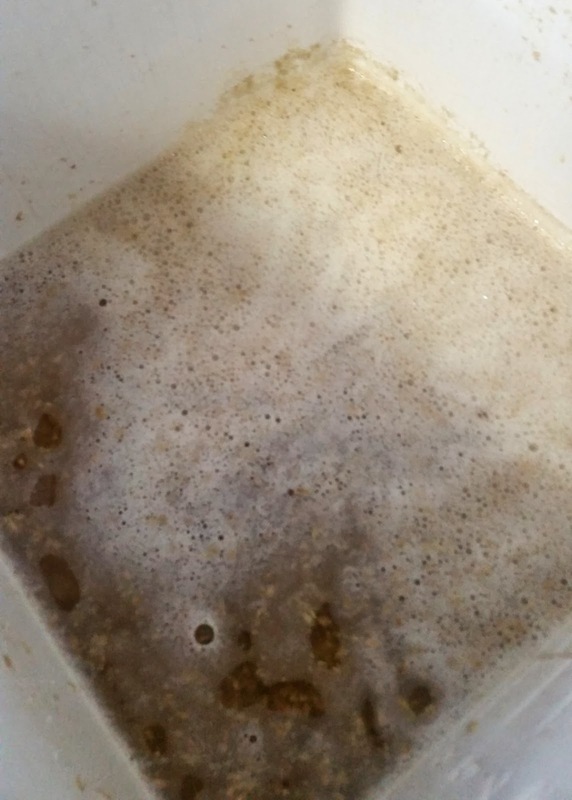 Within 12 hours after pitching the yeast, fermentation was well under way. I brewed this beer on Saturday, April 11. This entry was posted in pale ale, Uncategorized and tagged GIPA, Gondwana IPA, Gondwana Pale Ale, GPA. Bookmark the permalink.